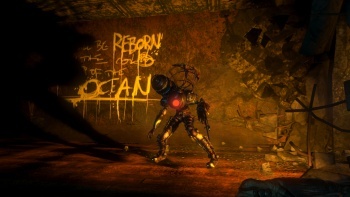 2K Games has revealed that downloadable content for BioShock 2 isn't just being planned, it's already in development. DLC is all the rage these days, so it's no great surprise that a hotly anticipated game like BioShock 2 would get some post-release love from 2K. The fact that the team is already at it shouldn't be much of a shock either, despite what we sometimes like to imagine about dedicated, hard-driving studios working to perfect their games right up to the last possible second. DLC take time, after all, and in the case of BioShock 2 the head start is no doubt made a little easier by the fact that the game is being worked on by studios spread across no less than three separate continents. "Absolutely!" 2K Marin Senior Systems Designer Kent Hudson told AustralianGamer.com when asked whether the game would in fact have DLC. "We are working on pretty aggressive plans for DLC and that's actually something that is already under-way," he continued. "That is something that is mostly being run out of the Marin studio because like I said the Australian studio is already ramping up on the next big thing." No details were given about what the new content could be, when we might see it or what this "next big thing" is that 2K Australia is apparently getting ready for, but given the size and history of Rapture, it could be just about anything. I'm going to go out on a limb here and guess hats - hats for the Big Daddy! What, you got a better idea? BioShock 2 comes out on February 9.